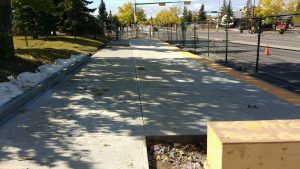 A few days back I wrote on my blog about the importance of proper planning when it comes to the City of Calgary’s biggest infrastructure projects like the Green Line and Blue Line. Today, I would like to focus more on the smaller projects in our communities. Those small infrastructure details that impact our lives on a day to day basis and our tax dollars in the long term. Unfortunately, some of these small projects have made the residents of Ward 5 not only scratch their heads but also upset with the lack of long term planning demonstrated by the city. 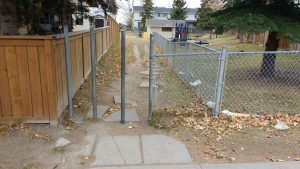 First, pedestrian shortcuts; the older neighborhoods of the NE are lucky to have this essential type of pedestrian infrastructure, it is supposed to encourage more walking, cycling and overall a more active approach of getting around the community. Unfortunately, I found this particular path with a very bizarre design that made moving incredibly constrictive. I’ve seen other pedestrian shortcuts in the area that are dirty and lack good public lighting but none so far that have had this poor of a layout. 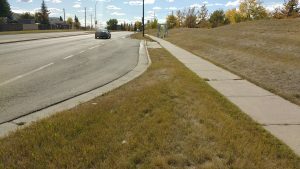 This particular spot is on Falconridge Drive and I came across it when I was planting lawn signs. What was more upsetting is that 2 minutes later I had seen two young women with a child having to lift a baby carriage over the metal bars in order to get through. This unfortunately, wasn’t the first time I witnessed something like this, I’ve seen mothers having to traverse these kinds of obstacles before. Our neighborhoods can’t be only designed for movement in an automobile. Our representatives and city planners must develop spaces and routes that encourage all residents regardless of income level or physical mobility to move around the area in a free matter that will in turn have a positive contribution to their health. Next, we have the new bus stops on 52nd street NE and Falconridge Boulevard NE. You’ve all seen them and many probably thought, great, we can have a more modern bus stop close to home. However this hope was quickly diminished as the final form of the station became to take shape. Firstly, many people have asked me while I was door knocking, why is the station so close to the lights? Wouldn’t this placement cause more traffic congestion? And I agree, the stations should be at least 50 yards past the intersection in order to cause less backlog in traffic. But more importantly if the city has green space available on the side of the street, why did it not use it to make a small exit to the right for the bus to get off the traffic lane? A bus station that would be located 50 yards higher up the street from the current location and with a small exit to the right would have made way more sense from a traffic, safety and overall utility point of view. What makes these decisions even worse is that we currently have these types of bus stops in our ward, on the exact same street, bus stops that have a more efficient design. With these examples in mind one might think that the city is actually taking steps backwards in how it develops its neighborhoods. 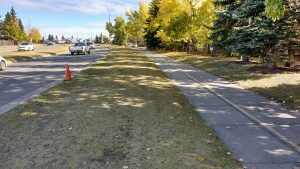 Some might criticize these observations as nonsensical or too small of an issue to spend this much time but the reality is, if our city is not able to get the small projects right, how can we trust them to do a good job with the more complex projects like the Green Line or the Blue Line?